Illiteracy is an issue that affects the whole community. Read how local programs, business, and volunteers came together to support a reading initiative through the development of a Reading Corner concept. Heart of West Michigan United Way's Schools of Hope tackles the problem of illiteracy with In School tutoring, After School literacy programs and Family Literacy classes. 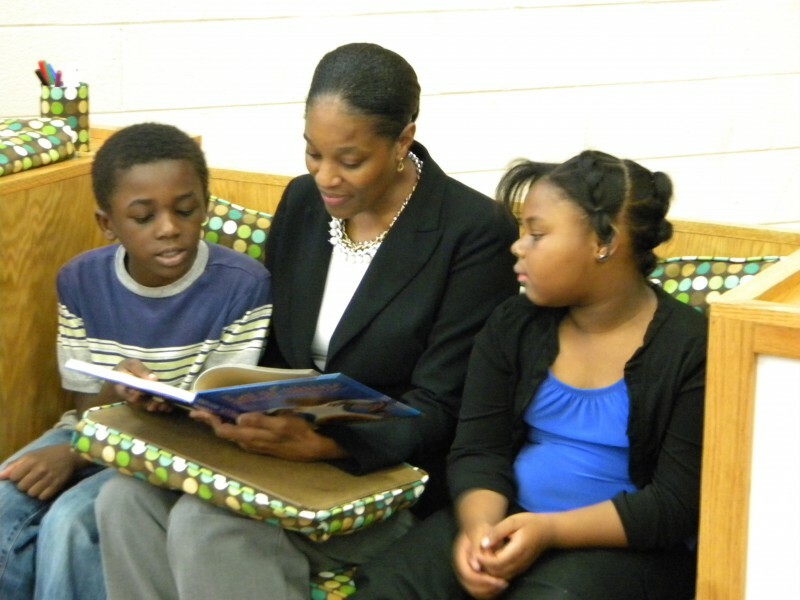 Their goal is to ensure that all Kent County students are reading at grade level by the end of third grade. We've probably all heard the ubiquitous adage "it takes a village to raise a child". Perhaps many of us have dismissed it as an over-used cliché, a meaningless phrase. But, at the core is truth: there is great value in all the parts of a community working together in concert for the benefit of its future generation. It's not necessarily just about children, of course, but about all of the important things worth raising up. Things like the hardworking projects and programs that gird the very foundation of our community. This year, the Volunteer Center was part of a "village" of local people, programs, and businesses that came together to raise up and support an essential need: a quality education in our community. It began with Heart of West Michigan United Way's Schools of Hope (SOH) Reading Program and a teenage girl with an idea, and grew to include a diverse group of volunteers and talents, all with the goal of building up our children through education. As the daughter of Schools of Hope's Literacy Trainer, Misti Stanton, young Alexis Stanton had heard many stories of the life-changing impact that reading intervention and targeted tutoring can make on the life of a child. She'd also heard about the challenges, needs, and aspirations of not just the program itself, but of the children it sought to raise up. Affected and inspired, Alexis had a vision of a special space in the tutoring rooms that would take the reading sessions a step further; a place where students and tutors could continue to explore reading and connect. She called those cozy, encouraging spaces Reading Corners. Together, Misti and Alexis developed the Reading Corner idea as a potential project for volunteers through United Way's Volunteer Center. Center director, Jane Royer, took the idea a step further and wrote a grant funded by the Michigan Community Service Commission to cover the initial cost of materials for a basic set up -- a rug, beanbags, and a bookshelf -- as she sought volunteers to complete the project. That was not, however, where the story would end. The village was just beginning to form. As a longtime supporter of Heart of West Michigan United Way, local firm Century A&E wanted to increase their philanthropic role and use the employees' architectural and engineering expertise to help the community. With that idea in mind, Century's Ivan Ivanov and Darrell Mason reached out to Jane, asking for assistance in connecting to projects that could benefit from their specialized design and construction skills. Not long before Century A&E approached Jane, she'd been deeply inspired by a visit to a Community Experience Partnership site in New York as part of the Encore work with the Grand Rapids Community Foundation. During the site visit, she experienced an excellent example of a program bringing together resources and support services to build up the best possible mentoring program it can. The partnership, Rochester Mentors, has created a sustainable system -- a circle of service -- around the core of creating high-quality mentoring programs. Their vision is to help people find their compelling connection to youth mentoring - either as a mentor, or someone who advances the cause with their own passions, skills and abilities. It was with that example that Jane could envision the impact Century A&E could make through donating employee time and design talent to support the Schools of Hope Reading Corner project. Their assistance could move the project from basic furnishings to a high-quality, well-designed space for continued learning and encouragement. Inspired by the Reading Corner idea, the Century A&E team readily accepted the challenge to work on a prototype. They joined with project leaders Misti Stanton and Volunteer Center AmeriCorps*VISTA member Maegan Pulley to design a cozy yet functional wooden bench with cushions and built-in bookshelves. Throughout the spring and summer, the Century team spent many hours on evenings and weekends working on the construction of the perfect Reading Corner prototype. Said Darrell, "We truly believe that we have an obligation to provide support for our community and are grateful for opportunities to contribute our time and talents." On Dr. Martin Luther King, Jr., Day 2012, Misti and Maegan led a volunteer project with teens and adults from the Delta G.E.M.S. sorority researching character-building books to stock the shelves and writing grants for the development of further Reading Corners. It was their goal to enable all the SOH tutoring rooms to one day have a special place for children and their tutors to interact, learn, and build the child up. 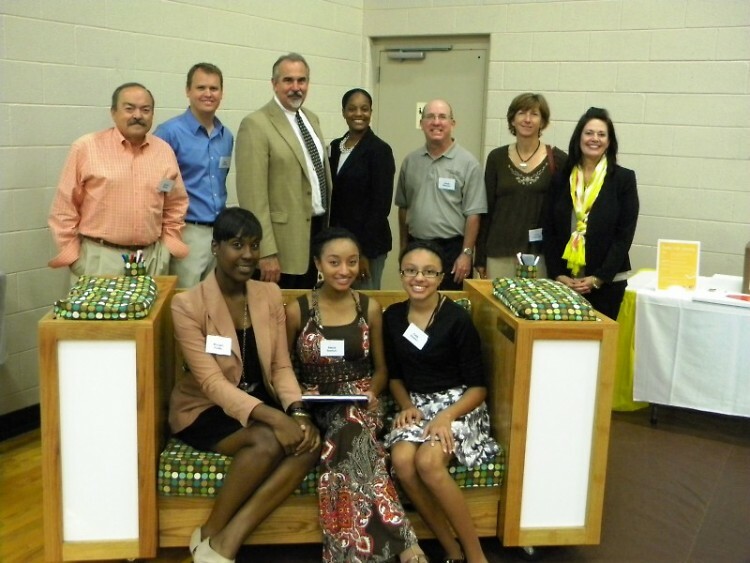 On August 23rd, the finished Reading Corner was unveiled at the Schools of Hope 2012 fall kickoff event. Based on a random drawing, the prototype corner will be awarded to Burton Elementary School's SOH room. Century A&E will be providing SOH staff with the plans, tips, and cost estimates the team has put together throughout the design and building process. Armed with that data, the grant research provided by the Delta G.E.M.S.,and skilled volunteer connections through the Volunteer Center, SOH will seek the construction of Reading Corners for each tutoring room. It is in those vital rooms, in the center of our village, that children at risk are encouraged and affirmed, and given the assistance they dearly need. And, whether they ever know it or not, there is an ever-increasing circle of volunteers, skills, and service surrounding them and raising them up.